Serengeti National Park is located on the Tanzania's northern border with Kenya. It is one of the most important African tourism circuits and an extension of the Kenyan Maasai Mara National Park. Below are a few interesting facts about the park. 1. The Serengeti National Park eco-system is the oldest on the planet. It boasts a diversity of flora and fauna that is unavailable anywhere else on the globe. 2. Serengeti is home to one of the world's seven natural wonders - the more than 1 million wildebeest Migration that crosses the Mara River in Maasai Mara National Park in Kenya to the Park in search of the green pastures. 3. In more than 1 million years, little has changed in the park. The wild animals, the plants and waterways are still largely intact as they were one million years ago. Amazingly, the oldest remains of man (2 million years ago) were discovered here by the famous East Africa archaeologist, Dr. Leakey. 4. 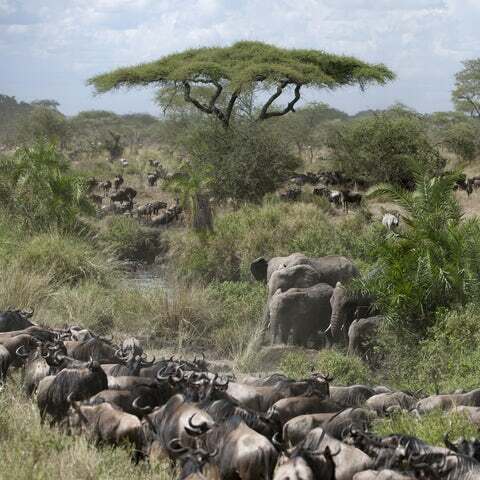 Most of the tourists focus on the more than 1 million wildebeest as they migrate. However, Zebras too migrate - albeit in smaller numbers. 5. Thousands of the migrating animals will never make it back to Maasai Mara national park as African crocodiles and other carnivores have a feast waylaying the herbivores as they cross the Mara River. 6. The Serengeti National Park is nestled at 3,020 feet to 6,070 feet above the sea level. Its climate is generally dry but gets a lot of rainfall in the months of June and July. 7. The Expanse of Serengeti is home to the only active volcano in the area - the Ol Doinyo Lengai. It ejects mineral rich carbonate lava that is washed down to the plains of Serengeti to fertilize the land. 8. Serengeti is largely savannah grassland with scattered pieces of Shrub land that is ideal for the herbivores to graze and good for the carnivores to hunt. Among the herbivores found here include, zebras, elephants, giraffes, wildebeests, antelopes, gazelles and buffaloes. Among the carnivores found include lions, cheetahs, leopards, hyenas, jackals, etc. 9. The Serengeti is the ancestral land of the Maa Community. The Maasai are one of the African communities that still practice their ancient cultural rituals such as circumcision, dances and sacrifices. 10. Serengeti is one of the cheapest National Parks in Tanzania. For the variety you will see, the park entrance fee is a bargain. Tanzania is one of the Eastern Africa countries that boast a Swahili culture. If you plan to visit the country, be sure to sample the Swahili cultural dishes and lifestyle over and above the jungle safari.